The unlicensed garment factory in the Bangladesh capital where seven women workers died in a fire Saturday was making clothing for Spanish giant Inditex and several French brands. An AFP correspondent sifting through the charred remains of the Smart Export factory yesterday found labels such as Bershka, a retailer owned by Inditex; Sol’s; Scott and Fox; and G Blog, which is part of France’s Gemo. Sourcing by global retailers first came under the spotlight just two months ago, after Bangladesh’s deadliest garment factory fire killed 111 workers who were making clothing for Walmart and a variety of Western firms. The November blaze at Tazreen Fashion, which also had no fire department licence, highlighted the Bangladeshi apparel industry’s appalling safety record. The fire at the Smart factory employing around 300 workers broke out Saturday afternoon, leaving at least seven female workers dead and 15 injured -- five of them critically. Worker Laizu Begum said the factory, which paid workers as little as $37 a month, had one of its doors closed when the blaze broke out during lunch break, forcing the workers to rush to the other door in a stampede. Major Mahbubur Rahman, operations director of the Bangladesh Fire Service, said the factory had not received an operating licence from the service. “It’s just a factory in name,” he told AFP. It was not clear whether Smart had won the orders directly from the European companies or was subcontracting for large local factories. Mohammad Akash, an official with Smart, told AFP the company mainly subcontracts from larger Bangladeshi factories including Mactex, which could not be contacted for comment. Of the country’s 4,500 garment factories, most are small plants in residential areas which depend on sub-contracted orders from bigger plants. Many operate only in peak seasons. Fire is a common problem in the factories in Bangladesh, the world’s second largest apparel maker. 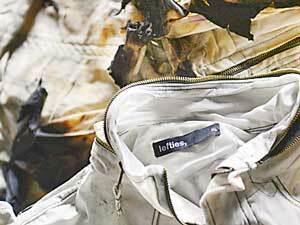 Around 700 people have been killed in garment factory fires since 2006. The industry is the mainstay of the impoverished country’s economy, accounting for up to 80 percent of annual exports worth $24.3 billion last year. Western retailers have criticised the Bangladeshi factories for not ensuring worker safety, but major brands still place orders. Some have reportedly increased purchases since the Tazreen fire, due to cheap manufacturing costs. International labour rights groups urged foreign brands and retailers Sunday to join a labour-supported agreement to prevent future tragedies.